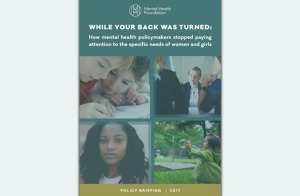 The mental health of young women and girls is deteriorating, and the gap between men and women has widened over recent years. As the evidence section in this paper will show, the last 15 years have seen an unprecedented rise in reported mental health problems amongst young women and girls. We now see their needs reaching crisis levels. Over a similar period, we have seen the mental health of young women and girls slip down the policy agenda. Whereas 15 years ago there were specific strategies for young women and girls, now their needs are tackled within the broader envelope of children and young people. This report suggests that there is a particular gap in understanding the underlying issues behind young women and girls’ mental health. Greater awareness of the factors leading to mental health problems in young women and girls will facilitate more effective prevention work. Drawing on recent work by others in civil society, it makes a series of recommendations for government.